Model: With digital decoder, controlled high-efficiency propulsion, light and sound effects functions. High-efficiency motor with bell-shaped armature and flywheel in the Jacobs truck. 2 powered axles. 4 traction tires. Continuous side skirting with guided plates over the wheel cutouts. Guide mechanism with closed bellows between the two halves of the rail car. Lighting with maintenance-free LED. Headlights will work in conventional operation, can be digitally controlled. Interior lighting, horn sound effect, as well as acceleration and braking delay can be digitally controlled with the 6021 Control Unit. Roof with separately applied details. Reproduction of the Scharfenberg coupler on the ends (without function) Length over couplings 48.4 cm / 19-1/16. 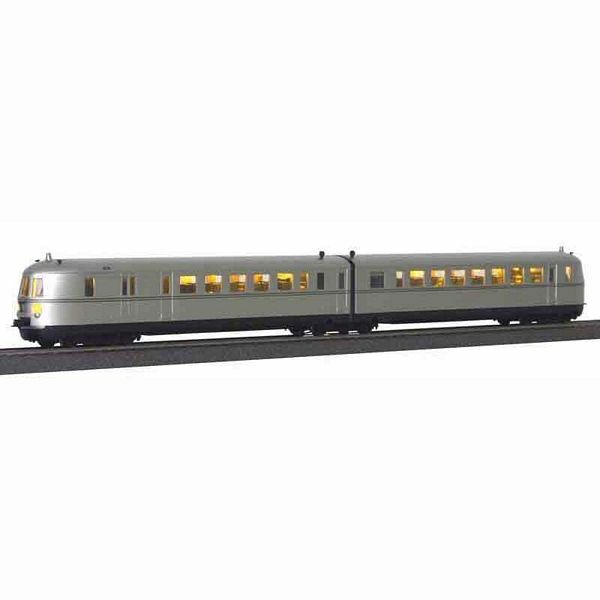 Model is based on the famous powered rail car from the era of the flying trains. Reliable tracking due to the genuine Jacobs truck. The Fastest Train in the World. In the 1920s the German State Railroad Company was faced with increased competition. Automobiles and airplanes made traveling more individual and faster. The day trip - depart in the morning, return at night - became an attractive offering for businessmen and the well heeled. If the Railroad company did not want to lose these customers, rail travel had to become faster. After initial attempts with the rail zeppelin (which set a world record for the fastest rail vehicle at 230 km/h or 143 mph, (a record which stood for 24 years), the German Railroad commissioned a two-piece combustion powered rail car. It was placed in service in May 1932 and linked the two metropolitan centers of Berlin and Hamburg. The express powered rail car raced through the 228 km or 142 miles stretch in 132 minutes. With an average speed of 128 km/h or 80 mph it was the fastest scheduled train in the world and took its place in history as the Flying Hamburger. The new express service was an immense success. Naturally the State Railroad ordered additional powered rail cars. This Hamburg type is the prototype for our model. The design was improved for the VT 137s; they received a modified front part, and they were equipped for double unit travel. The propulsion system worked in accordance with the diesel electric principle. A unit comprised of a 12-cylinder diesel motor and generator sat on each of the two end trucks. These units functioned as power plants which generated the electricity for the electric traction motors. They were placed on the two axles of the middle Jacobs truck, which combined the two halves of the car. The express service network of the SVT was quickly extended. To and from Berlin the Hamburg-type powered rail car traveled to Cologne, Frankfurt, Leipzig, Stuttgart, and Munich; there was also a direct connection between Hamburg and Cologne. The German State Railroad held the 03 class streamline steam engine in reserve as a backup. They could jump in with a three-part skirted passenger car composition in the event that an SVT failed. As opposed to the prototype, the Hamburg class received a multiple control unit. The stretch from Berlin to the south was traveled as a double unit. In Nurnberg the two powered rail cars were separated, and they continued on separately to Stuttgart, or Munich, respectively. Train and station personnel were trained for this separation maneuver in order to save time. After a 60 second stop the first powered rail car moved out of the station, after another 60 seconds the second powered rail car left the station. On the return route the two cars were re-coupled in Nurnberg. Today we are familiar with this type of double unit operation from the ICE 2.